Democrat Leticia Van de Putte will face Republican Dan Patrick in the race for Texas' second-highest public office following a competitive GOP runoff. The matchup is certain to make immigration a hot issue in the campaign. Patrick, who defeated Lt. Gov. David Dewhurst with tea party support Tuesday night, has been vocal in opposition to immigration reform and his support for tougher immigration enforcement. A conservative radio talk show host, Patrick debated San Antonio Mayor Julian Castro, recently nominated by the president to be Housing and Urban Development secretary, on the issue. Castro had blasted Patrick for saying the state was subject to an “invasion” of illegal immigrants. In his victory speech, Patrick vowed to seal the U.S.-Mexico border and said he would campaign for Hispanic and African American votes. “If the Democrats think that they’re going to bring Obama liberalism to Texas and win, they have a long, cold day in November ahead of them,” Patrick said. 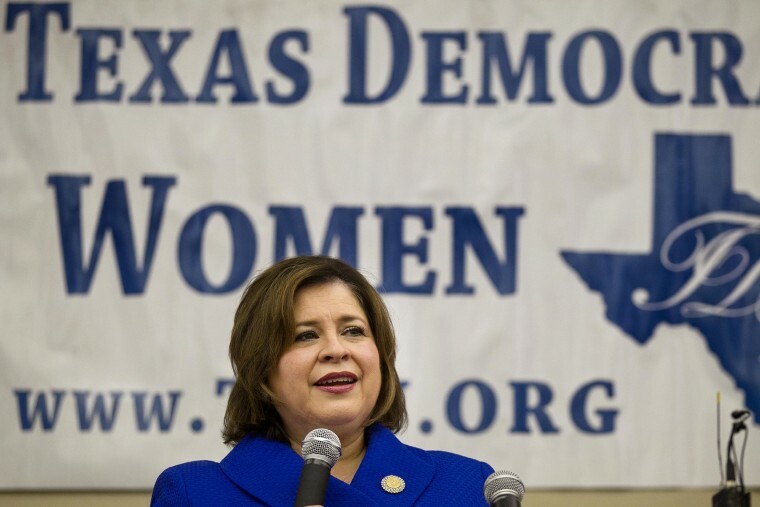 In San Antonio, Van de Putte, who is Mexican American, quickly went on the attack. She said he is more interested “in the report cards fringe groups give him” than the report cards of the state’s children, the Houston Chronicle reported. “He’s a great entertainer a great radio personality, but I never know if it’s the ‘theater Dan’ or the ‘real Dan,’ ” she said, according to the newspaper’s report. The race is an uphill battle for Van de Putte. Republicans dominate Texas public offices and have held them for years. Also in Texas, Republican Will Hurd defeated former U.S. Rep. Francisco “Quico” Canseco for the chance to face Democrat Rep. Pete Gallego in the race for congressional district 23. The border district sweeps from San Antonio to El Paso. Gallego won it in 2012 with 50.3 percent of the vote, but Romney won the district with 51 percent of the vote.